Brig. 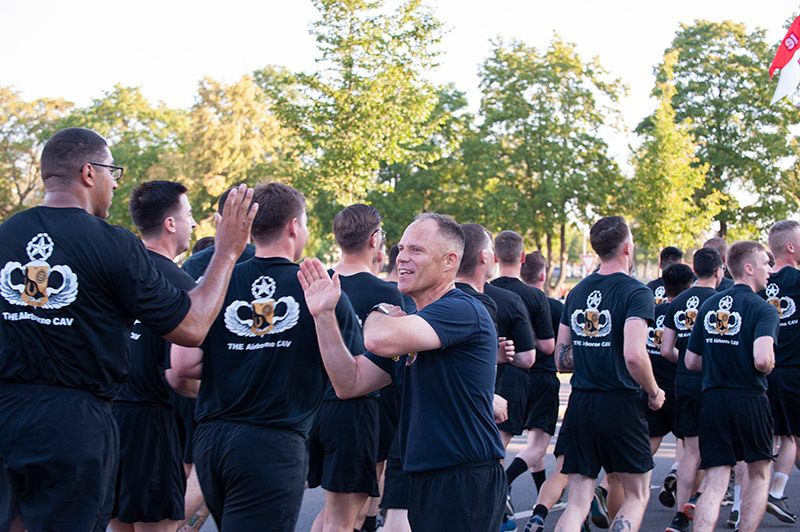 Gen. Christopher LaNeve, Commanding General for the 7th Army Training Command, greets Soldiers at the end of the unit run July 25, 2018, at Grafenwoehr, Germany. A pair of memos, including LaNeve’s, addresses the use of reflective PT belts and vests. GRAFENWOEHR, Germany — Reflective devices such as belts and vests are no longer required to be worn when conducting physical training in daylight or along closed PT routes at U.S. Army Garrison Bavaria installations, according to a pair of memos released by the senior ranking officer here and the Secretary of the Army. Soldiers are still required to wear reflective PT devices in darkness and on non-closed PT routes. Brig. Gen. Christopher LaNeve, commander of 7th Army Training Command, released a memorandum dated June 15, 2018, addressed to Bavaria military commanders. It applies to all Soldiers stationed here or on rotational duty. PT routes close down select streets on the installations typically between 6:30 – 7:30 a.m. during the regular work week. PT routes are marked by road guards. LaNeve is also the General Officer for Force Protection at U.S. Army installations in Bavaria, which include Ansbach, Garmisch, Grafenwoehr, Hohenfels, Illesheim and Vilseck. To ensure their safety, Soldiers must wear reflective belts or devices when conducting PT off closed routes. The U.S. Army safety program regulation, AR 385-10, states that Soldiers should wear personal protective equipment when exposed to traffic hazards when marching, running and jogging. The Army Europe pamphlet AE Pam, 385-15-5 titled “Leaders Guide to Accident Prevention in Physical Training Running Formations” provides further guidance. Community members behind the wheel of an automobile are reminded to always err on the side of caution during PT hours and yield to troops in PT or formation.